Linguistics as UC Irvine -- A.K.A. 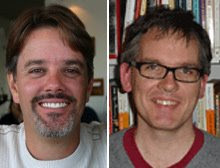 UC OC -- just got a huge boost with two new faculty, Lisa Pearl and Jon Sprouse, both products of Maryland Linguistics. Lisa and Jon will join the Department of Cognitive Sciences effective July 1, and will form part of the core of a new proposed Center for Language Science. We will be teaching them both how to surf shortly after their arrival. I'm happy to report that my former grad student Ana Gouvea got a job this year as well, in Miami (where she lives, conveniently), at Florida International University. In fact, it was a great year for Maryland Ph.D.s and post-docs -- lots of people got great positions. Pretty great, that.